Husain, Raza works leave art lovers "floored"
New Delhi: One of India's oldest and best-known contemporary artists, S.H. Raza, at 88, has just begun work on a new series of art to mark his homecoming after six decades in Paris. He says he wants to live in India as a "tax-paying, Hindi-speaking" citizen. "I have sold almost all my old works in Paris. I brought back a few small art works. So, I have just started sketching once more. Galleries are queuing up to exhibit my work," Raza told IANS in an interview here. Raza, who has held a French passport all these years, has purchased a home comprising two elegant floors of an apartment block in the Indian capital - to embark on a new phase of creative career. He wants to exhibit his new body of work. The homecoming art series is a set of random sketches of trees, huts and complex patterns in ink inscribed with the words "bindu" (dot), central to all his compositions, and "avartan" (recurrence). The word "avartan" is a gift from friend Ashok Vajpeyi, the chairman of the Lalit Kala Akademi, the artist said. Rs.16.42 crore ($3.5 million) at a Christie's auction. The massive acrylic composition on canvas was purchased by the Kiran Nader Museum in Noida. It was unveiled for public viewing by the museum as a permanent exhibit on its new premises in Saket here Wednesday. Raza had left India in 1950 after winning a scholarship to the Ecole Nationale Superieure des Beaux-Arts and lived in Paris for more than 60 years. He was part of the elite group of Progressive Artists with M.F. Husain, F.N. Souza, K.H. Ara and V.S. Gaitonde. He returned to India Dec 29 last year. "I am happy to be back to India. I came back alone. My wife (she was French) passed away in 2002. My siblings scattered long ago and some of them are dead. 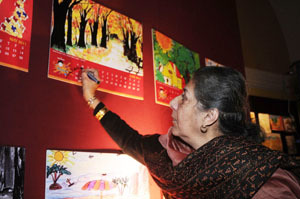 I returned because I love the Hindi language and am attached to it," the artist said. He is trying to reconnect to his roots. "I visited Rajghat and the Hindu temple at Chhatarpur and want to go to Barbaria in Mandla district of Madhya Pradesh where I was born. I have to assimilate with the environment and I want to live as a tax-paying Indian citizen," Raza said. His return to India marks a renewal of the contemporary art fraternity's ties with the Mumbai-based Progressive Group of Artists who tried to take Indian art out of his European cast to give it a distinct Indian identity. "F.N. Souza, M.F. Husain and I went our own way while Ara and Gaitonde remained committed to the progressive school," Raza said. The artist remembers his days of "debates and clashes" in Mumbai as a member of the Progressive Group of Artists when everyone had strong views. "The year was 1947-48. India was independent and we were thinking what artists should do about art. We exchanged ideas because we had to go to a new direction. Indian art was being taken seriously across the world," he said. "I said the Bengal modern school had given us a new direction but Souza was very outspoken and could not see eye to eye. Working together was not an easy thing. You have to be alone to work," he added. "But I want Husain to return. I met him in London last year," Raza said. Husain, who has been frequently targeted by members of the Hindu rightwing in India, is now based in Qatar and is a citizen of the Gulf country. Raza owes his aesthetic identity to the "bindu" that he learnt in school, when his schoolmaster drew it on a white wall and told him to concentrate. "I forgot all about it for 30 years, when it resurfaced when I asked myself one day at the pinnacle of my artistic career in Europe where was the Indian element in my work," he said. "I automatically thought of the 'bindu' and it returned to my work, along with the pancha tattwa - the five basic colours of red, yellow, black, blue and white," he added. Raza's work was secular but with defined Hindu mystical influences, the artist admitted. "Hindu art is really extraordinary and important whereas Muslim art is architectural and decorative representing the faith," Raza said. Raza was honoured with the Padma Bhushan in 2007. Cabinet Reshuffle: New council of ministers of Manmohan Govt.